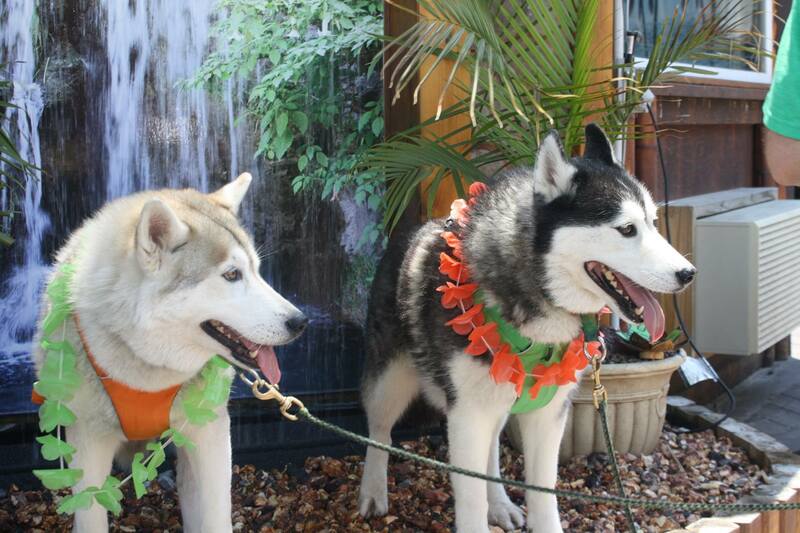 LI-DOG’s 2nd Annual Pints-n-Paws™ Luau! 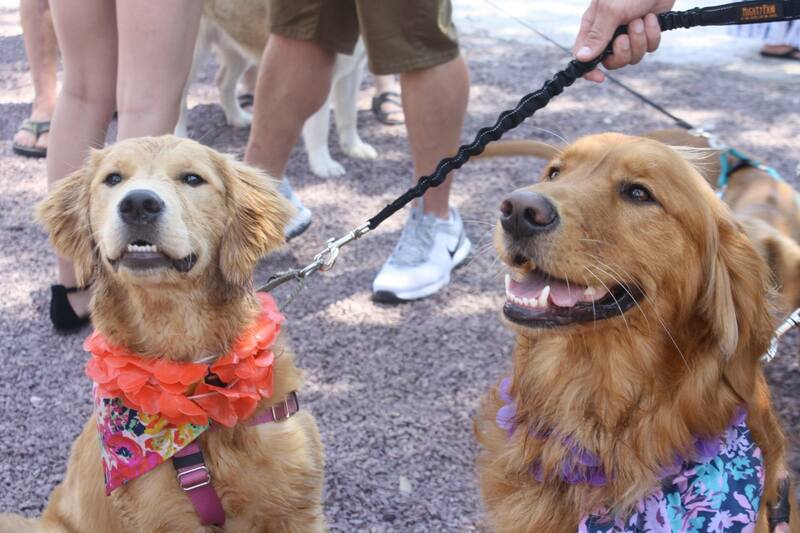 LI-DOG welcomed the summer of 2017 with a puppy party on the beautiful waterfront patio of Off-Key Tikki Waterside Bar and Grill in Patchogue. The palm-tree studded venue was the perfect setting for LI-DOG’s 2nd Annual Pints-n-PawsTM Luau on Sunday afternoon, June 11th! The event featured games, raffles, a barbeque generously donated by Off-Key Tikki, tropical drinks, a tropically-themed photo set for selfies, and music provided by Off-Key Tikki’s band plus our own MC-extraordinaire Mike Kaplow. Even though it was a very hot day, the palm trees, umbrellas and kiddie pools kept people and pups cool and comfortable. Our contests—Biggest Lap Dog, Silliest Dog Trick and Best Dressed Doggie and Me Margaritaville Contest–had some fierce competition as fur babies of all sizes—from tea cup to terrier to tremendous—participated. Congratulations to our winners and thanks to our outstanding team of judges: Sean Desmond, Lana Bongiovi, and Heidi Walker of our Special Guest Yorkie911 Rescue who were there with adorable adoptable pups! With almost 20 graciously-donated baskets raffled off, lots of pooches—and their human parents–had extra toys and treats to take home. Great thanks and much appreciation to all our raffle basket sponsors including: Laura Pea Photography, Deb’s Healthy Pet Center, LI Canine Class, All Island Pet Supplies, Joelle Siemers of Netter Real Estate, TLC Doggy Day Spa, Dog House Boarding, The Refuge, Cloud Star Treats, Earth Rated Poop Bags, Jones Natural Chews, Petrageous Designs, Craft Kitchen & Tap House, and Coastal Pet Products. PLUS, all our friends who donated baskets in honor of their dogs and to support LI-DOG including: Amanda Muller, Dawn Licona, Joann Garguola, Kim Varvaro of Husse Dog Food and One Paw Out the Door Training, Nikki and Kenny Koperda, Rise Armell and Sherri Hsiu of collarcrush.etsy.com. 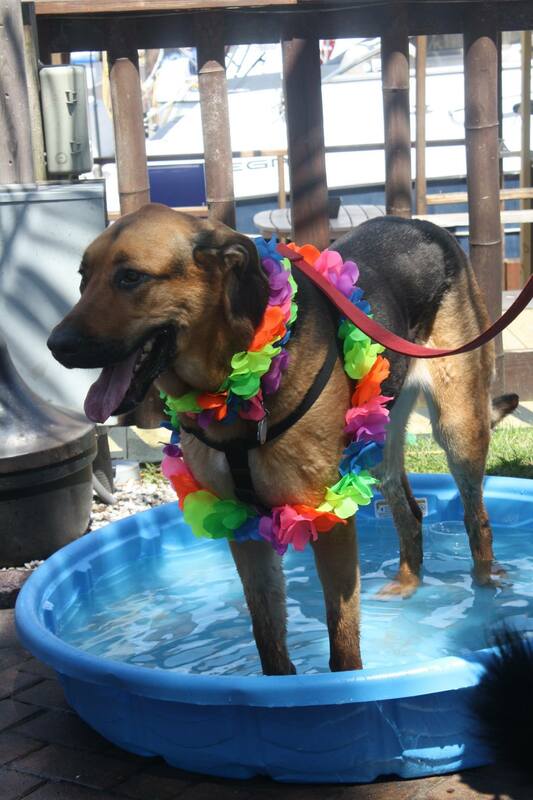 Your donations helped make our 2nd Annual Pints-n-PawsTM Luau the most successful fundraising event ever for LI-DOG! Plus, special thanks to our accommodating and generous host, Off-Key Tikki Waterside Bar and Grill, for providing the BBQ and welcoming us back to their awesome place! Also, major thanks to both of our photographers, Laura Paesano of Laura Pea Photography and our colleague Joann Garguola, for their great shots of dogs and people. Check out their photos and lots of others on the LI-DOG Meetup and the LI-DOG Facebook Group. Thanks also to Joann for making the amazing pineapple palm tree display and fruit salad! Our Luau would not have been as successful and fun without LI-DOG’s amazingly creative and talented event organizers—Marie Amsterdam, Joann, and Irene Rabinowitz. Thank you to all three for making the Luau so successful! Plus, we had a large crew of GREAT volunteers including: Sean and Sam Desmond, Vicky Lick, Danielle Scala, Suely Vera, Barbara Striegel, Karen Dikeman, Melanie Katz, Judy Dickson, Nicole and Roy Casimir, Bryce and Lloyd Amsterdam, Lana Bongiovi, Sherri Hsiu, Lynn Kay Kosefsky along with LI-DOG Board member Chris Laubis. Thanks to everyone who came and contributed to making this a great event!